A Personalized Baby Book | What A Unique Baby Shower Gift! Makes A Unique Baby Shower Gift! A personalized baby book makes a unique baby shower gift. Pair it up with The Baby Book Shower, your favorite childhood books and our baby shower bookmark favors. This is the perfect gift for a baby shower when you know Baby's name! Or as an "after shower" gift. A personalized gift that adds such a special touch and a unique keepsake for Mom-To-Be! Want to add Baby's picture to a book? Keep reading below ... It's just like being a star in baby's very own book. 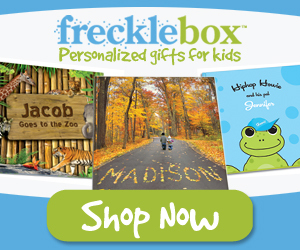 See More Personalized Books and Gifts at Frecklebox. perfect for an awesome shower gift! More First Act Discovery Products! All American Trivia Game Jr. Remember to include a small gift for Big Brothers & Big Sisters with personalized books for kids expecting a new baby in the house. More information on Big Brothers & Big Sisters Books below. Have your guests bring their favorite early childhood books and start Mom-To-Be out with a wonderful library of books to read to Baby each night. Studies have shown that babies who are read to every day, are more intelligent and do much better in school. For the FlattenMe Baby Book, let Mom-To-Be know that you'll need a picture of Baby for a special gift. She'll love this special keepsake and it will be well worth the wait! Add a hand written card with your intentions to a gift basket of favorite childhood books for the perfect unique baby shower gift. Tip: Also add some fun stuffed animals, rattles, teething rings ... maybe even some baby towels and washcloths, you know ... getting ready for that bedtime story. Visit our Unique Baby Shower Gift Boutique for Baby and Children's Books ... where you'll find your all of your favorite childhood books! Sometimes big brother and/or big sister are a little anxious about the arrival of a new baby. So, be sure to make them feel special as well. A personalized book for kids with the child's name and picture included in a book make her/him feel like a star as well!